Are you in need of a chocolate fix? See which brands are most loved by New Zealanders with our customer satisfaction ratings. Canstar Blue research finalised in March 2016, published in April 2016. 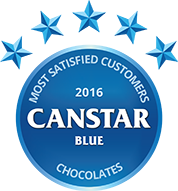 Whittaker’s stands above the rest, receiving five stars in overall satisfaction and earning Canstar Blue’s inaugural award for Most Satisfied Customers – Chocolate. Adding to this accomplishment, Whittaker’s received a perfect score, rating five stars across all criteria. There are two kinds of people in this world – those who love chocolate, and those who are wrong. But let there be no doubt, we’re a nation of chocoholics. In fact, our research found that chocolate is the go-to treat of choice for 49% of Kiwis when it comes to naughty foods. And interestingly, significantly more women held this opinion than men (56% versus 40%). While one in five (19%) respondents to our survey admitted that eating chocolate makes them feel guilty, almost one in four (23%) will still eat chocolate more than three times a week on average, while 27% of us can eat an entire standard chocolate block in just one sitting! Our research also suggests that we’re quite adventurous when it comes to the chocolate we buy, with 36% of respondents saying they like to try all of the new flavours. Meanwhile, 34% will choose to eat dark chocolate because it’s the healthier alternative. Interestingly, only 2% say they will only buy fair trade or organic chocolate. New Zealand is lucky in that we’re spoiled for choice when it comes to chocolate, but with so many options, who can you count on to deliver on satisfaction? That’s where Canstar Blue can help. After canvassing the opinions of almost 2,000 New Zealanders nationwide, we can report that Whittaker’s stands above the rest, receiving five stars in overall satisfaction and earning Canstar Blue’s inaugural award for Most Satisfied Customers – Chocolate. Adding to this accomplishment, Whittaker’s received a perfect score, rating five stars across all criteria. Whittaker’s was created by James Henry Whittaker in the late 19th century. The company says it takes great pride in its heritage and remains within the Whittaker family to this day. Whittaker’s produces 13 premium products including blocks, slabs, k-bars, ice cream and more which come in a massive range of flavours. Lindt is a premium chocolate manufacturer offering its products to over 120 countries worldwide. The company claims its chocolate revolutionised the industry, after one of its founders, Rodolphe Lindt, accidently discovered a process called ‘conching’, which it says makes its chocolate some of the smoothest in the industry. Nestlé is a large multinational company that produces a huge range of foods and beverages through its subsidiaries. Some of its most popular confectionery brands include Aero, Kit Kat, Milky Bar and Smarties. Cadbury offers a massive range of chocolate, blocks, bars, bags, baking goods and more. Some of its most popular products in New Zealand include Jaffas, Marvellous Creations, Moro and Pinky. Canstar Blue commissioned I-view to survey 2,500 New Zealand consumers across a range of categories to measure and track customer satisfaction. The outcomes reported are the results from customers within the survey group who have purchased and eaten a chocolate block in the last three months – in this case, 1,986 New Zealanders. Chocolate has a bad reputation. But did you know it can actually be good for you? Find out more at Canstar Blue.